(From Tamron lens literature) At Tamron, our quest has always been to make the ideal zoom lens. As a result of this ongoing challenge, we have introduced the concept of our high-power zoom lens in the new AF 18-200mm XR Di II for exclusive use with digital SLRs. Tamron's original development of proprietary core technologies such as Aspherical element production, Multiple Cam Mechanism and Integrated Focus Cam design lend to the creation of the world's lightest, most compact 11.1X zoom lens made for digital SLR cameras. The 18-200mm (28-300 when converted to 35mm) provides the digital photographer with the versatility of a true wide to ultra tele zoom in an amazingly easy to use design. Note: PMA, January 31, 2008, Las Vegas, NV -- Mr. Morio Ono, president and CEO of Tamron Co., Ltd., announced that the company has developed AF18-200mm F/3.5-6.3 XR Di II (model A14) with a Built-In Motor for Nikon. Of course, there's never a free lunch, and in the case of long-zoom lenses, this means that tradeoffs inevitably have to be made. For the Tamron 18-200, the tradeoff is that it is significantly soft in the corners and edges when shooting wide open, pretty much across the focal length range. As always though, closing the aperture down a stop or two makes a big difference. At 18mm, shooting between f/5.6 and f/8 delivers pretty impressive sharpness, but you'll have to go to f/16 for the best results at 50mm, and to f/11 at 100-200mm. Even stopped down though, this lens is a little soft at 200mm. Chromatic aberration is high at both ends of the zoom range (wide and telephoto), but is actually quite low over a broad range of medium focal lengths. Vignetting is very low, with a maximum of about 1/3 stop at wide angle and maximum aperture. Stopped down to f/5.6, it's never more than 1/4 stop, and often quite a bit lower. Distortion covers quite a range, from about 1% barrel at 18mm, to about 0.6% pincushion at 50mm, finally decreasing to about 0.4% at 200mm. When calculating the bottom line for this lens, it's important to consider its intended market, and its very affordable price point. Can you do better with multiple, more expensive lenses? Without question. But if space and convenience are overriding concerns on a long trip, softer images may be an acceptable price to pay. Possibly even more important than the sheer convenience factor though, is the security of not having to worry about dust entering your camera body as you swap lenses on and off in less-than-pristine environments. - This is actually a fairly serious issue with digital SLRs, as dust on the sensor will show up in every shot you take, and your ability to clean your camera's sensor is likely to be severely limited while traveling. So here's the bottom line: If you need to just put one lens on your camera and leave it there, yet still want to cover a focal length range from wide angle to a fairly long tele, this lens is a good, affordable solution. NOTE: We've now posted a test of this lens' successor, the Tamron 18-250mm f/3.5-6.3 Di II LD Aspherical IF Macro AF. This new model significantly outperforms the 18-200mm, albeit for a street price that's about $100 higher -- so you may want to consider that newer model if you're in the "Vacation Lens" market. The 18-250mm review also compares and contrasts that lens with all the other long-ratio zooms on the market, making it a good point of reference if you're shopping for a lens of this type. Check it out! 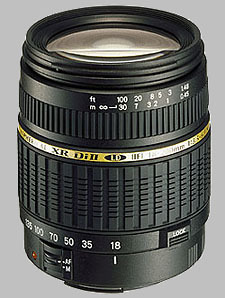 good for basic and walkaround lens. Used outdoor in daylight, this lens performs well. It gives decent sharpness & color renderings. Use in lowlights/indoor.. this lens will hunt for focus like crazy. It won't be pretty usable in lowlights due its slow aperture (f/6.3) and lack of VC. I prefer using the lenskit combo (18-55 & 55-200 with VR/IS) than this lens. I am very unimpressed with this lens on the A77 Sony and while it may be a good lens, I believe that it is not that compatible with the Sony camera. Likely works better on Canon or other cameras. I sent it back within 2 days to Amazon and exchanged it for a Sony 18-250mm The results are like night and day. I have a Nikon D3100 dslr with the nikon 18-55mm kit lens.i am planning to buy the tamron 18-200mm.what i want to knwo is whether this lens autofocusse with the d3100 and whether anyone has used this combination. Price, zoom range, compact, reasonably well built. Zooms the wrong way on Nikon. Low AF gearing. Bought new when one of the chains was off-loading stock to buy in the motorised version at a price I couldn't beat. Normally on my D50 as a walk around, also used on my D1x when I need the reach and minimal gear to carry, though I prefer my Nikon 18-70 and Adaptall 80-210 MF on that one normally. Nikons 18-200 VR is too expensive, the VR and Sigma's OS version reportedly have issues with their VR reliability, so the simple NON VR option has advantages, if they'd only include a manual aperture ring as well! Compact, good range, cheap, well built, not perfect but acceptable enough. Very usefull Zoom-range, fair corner sharpness. Cost more then Sigma 18-200 but performes generally worse, rotating lens. Why does this get better grades then Sigma 18-200? When i compare theese side by side it seems Sigma 18-200 is better in important areas like 200mm f6.3 and center sharpness. Tamron 18-200 seems to have blur at lager areas of the picture then Sigma's 18-200 but Sigma have more blur at the corners. Very nice lens all around, great for the price. When in manual focus it is not very smooth. I decided to try it because the price and availability of the Nikon 18-200mm VR. The VR would be good for shooting at 200mm in low light. It is far better than I had expected. I've been using this lens for about 6 months on my Pentax *ist DS and taken a few thousand shots. Since I'm looking more for convenience than absolute image quality, I would have to say I'm mostly satisfied with this lens. Outdoors the lens performs well. Indoors with flash, my most common usage, I've had some auto-focusing problems, but not consistently. In those situations I just fall back to manual focus without a problem. My most common use of this lens is for family photos. When printed at 4x6, the family has often commented how how nice the prints looked in comparison to their point and shoot prints. Construction quality of the lens seems good, but perhaps a notch below my Pentax lenses. Should this lens ever get ruined, I would not hesitate to buy another as a replacement. Just returned from vacation and took nearly 2000 photos and am very pleased with the results. This lens will never be confused with a Canon prime or an L series lens it is an excellent value. All photos were shot using RAW and process using DXO and PhotoShop Elements. I bought this lens over the Sigma 18-200. I never did regret my choice. Noisy motor, slower than average AF. Sure the Nikon Vr 18-200 is better, But not everone has the money to pay 2X the amount i paid for this lens to do the Job. On my D50 and my brother's D70s, it works flawlessly. I especially love the barrel lock to prevent creeping when I am holding facing downwards and it comes COMPLETE with Flower Hood and all caps, and a 6 year warranty. Overall a GREAT lens for hobbists like myself.